In the list of your profiles, you can also choose the contacts who can see a specific profile. Just click on "Edit visibility" next to the profile in question (only available for the profiles that are not your default profile) and then click on user images to add them to or remove them from the group of people who can see this profile. Once you have done this, your channel is ready to use. At http://hub1.sprechrun.de/channel/username you will find your channel "stream". This is where your recent activity will appear, in reverse chronological order. If you post in the box marked "share", the entry will appear at the top of your stream. You will also find links to all the other communication areas for this channel here. The "About" tab contains your "profile", the photos page contain photo albums, and the events page contains events share by both yourself and your contacts. Connections in Hubzilla can take on a great many different meanings. But let's keep it simple, you want to be friends with somebody like you are familiar with from social networking. How do you do it? The next thing you can do is look at the Directory. The directory is available on every Hubzilla website which means searching from your own site will bring in results from the entire network. You can search by name, interest, location and keyword. This is incomplete, so we'll improve this paragraph later. Visit their profile by clicking their photograph in the directory, matrix, or comments, and it will open their channel home page in the channel viewer. At the left hand side of the screen, you will usually see a link called "connect". Click it, and you're done. Depending on the settings of the channel you are connecting to, you may need to wait for them to approve your connection, but no further action is needed on your part. Once you've initiated the connection, you will be taken to the connection editor. This allows you to assign specific permissions for this channel. If you don't allow any permissions, communication will be very limited. There are some quick links which you can use to avoid setting individual permissions. To provide a social network environment, "Full Sharing" is recommended. You may review the settings that are applied with the quick links to ensure they are suitable for the channel you are connecting with and adjust if necessary. Then scroll to the bottom of the page and click "Submit". You may also connect with any channel by visiting the "Connections" page of your site or the Directory and typing their "webbie" into the "Add New Connection" field. Use this method if somebody tells you their webbie and you wish to connect with them. A webbie looks like an email address; for example "bob@example.com". The process is the same as connecting via the "Connect" button - you will then be taken to the connection editor to set permissions. If you have set any of these permissions to "only those I specifically allow", you may specify indivudal permissions on the connnection edit screen. 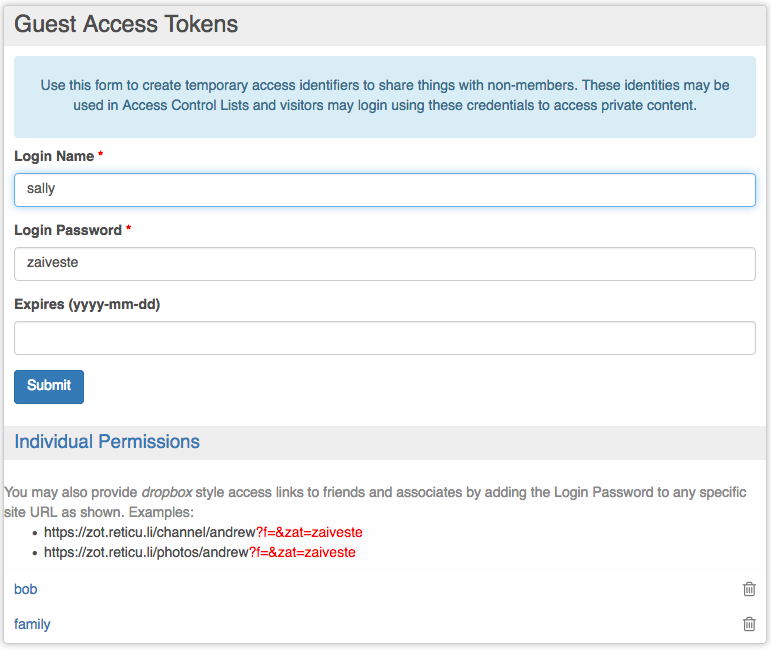 To create and manage guest tokens, open the Guest Access Tokens settings page. A random token is generate with each page load, allowing you to create one by inputting an associated user name and optionally specifying an expiration date. Existing tokens are listed below the dialog and can be edited by selecting them or deleted by pressing the trash icon. Hubzilla enables users to create static webpages. To activate this feature, enable the Web Pages feature in your Additional Features section. The "page link title" box allows a user to specify the "pagelinktitle" of this URL. If no page link title is set, we will set one for you automatically, using the message ID of the item. To delete attachments or change the permissions on the stored files, visit http://hub1.sprechrun.de/cloud/username replacing username with the nickname you provided during channel creation. Your files are visible on the web at the location http://hub1.sprechrun.de/cloud/username to anybody who is allowed to view them. If the viewer has sufficient privileges, they may also have the ability to create new files and folders/directories. When using WebDAV, the file is created with your channel's default file permissions and this cannot be changed from within the operating system. It also may not be as restrictive as you would like. What we've found is that the preferred method of making files private is to first create folders or directories; then visit http://hub1.sprechrun.de/cloud/username select the directory and change the permissions. Do this before you put anything into the directory. The directory permissions take precedence so you can then put files or other folders into that container and they will be protected from unwanted viewers by the directory permissions. It is common for folks to create a "personal" or "private" folder which is restricted to themselves. You can use this as a personal cloud to store anything from anywhere on the web or any computer and it is protected from others. You might also create folders for "family" and "friends" with permission granted to appropriate privacy groups. 4. Type #^https://example.net/dav/your_channel_name in the textbox and click the Complete button where "example.net" is the URL of your hub. 5. Type your Hubzilla account's user name. IMPORTANT - NO at-sign or domain name. Where http://hub1.sprechrun.de is the URL of your hub, /mount/point is the location you want to mount the cloud, and <DesktopUser> is the user you log in to one your computer. Note that if you are mounting as a normal user (not root) the mount point must be in your home directory.